*This gem of a town house is tucked away on a lovely residential street mere steps from Times Square (less than a block away from the Times Square Subway). The guests quarters are large, around 1250 sq. ft., and filled with natural light. It faces the gardens between buildings, giving it a sense of calm and quiet that is rare and precious in this part of the city. The street is tree and brown-stone lined, but is less than 1/2 a block away from the excitement of the Hell's Kitchen and Times Square area. This part of the city, beside the attractions of Times Square itself is, both a cultural and transportation hub. Hell's Kitchen is widely considered the food capital of New York, with countless trendy, classy, and exciting restaurants of every variety and style. In addition, you are at the center of New York's bustling Theater District. Got a Broadway show to catch? They are all within a 10 minutes' walk of the apartment! The Apartment has 2 twin beds, 1 queen bed, one pull out sofa bed fit for 2 people, and another large sofa. The kitchen is fully equipped with all necessary appliances and utensils in case you get bored of eating out. There is also cable TV with on demand movies. If you get tired of TV, the apartment is full of books and there are a few boardgames. There is Wifi and air-conditioning. If you decide to enjoy a quiet evening in, the apartment is comfortably furnished. The minimum stay is very flexible, please email us instead of doing if you would like a shorter stay or a discount for a longer stay. Thanks! We hope to hear from you. One of the best rental experiences we’ve had yet! Location couldn’t be more perfect, owners were extremely friendly and quick to respond. The apartment was impeccably clean and much bigger than the pictures appear online. Will be staying here again! 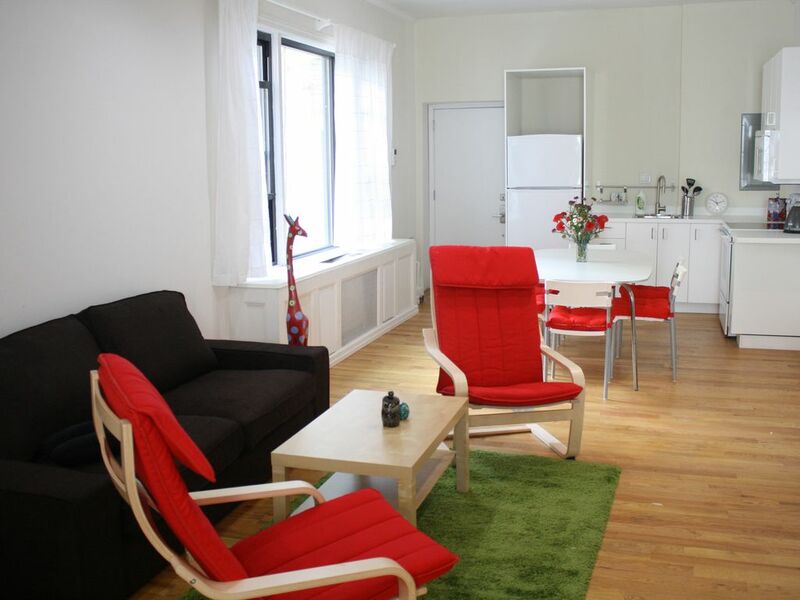 We really enjoyed our stay and the apartment is very large and in a great area of Manhattan. So many restaurants and grocery close by but the street is quiet and the apartment is even quieter. Other than occasional siren you would not even know you were in NYC. Owners quick to respond to any requests. Lots of light in the morning and ceilings high. Thank you for our wonderful visit to NY. Clean, sunny and quiet residence. Very clean apartment in quiet street. Close to Times square and theaters. Very kind and prompt hosts! The owner was very friendly and welcoming with a lot of tips for the city. Location was great. Lots of restaurants, shopping, shows very close by. Apartment was clean and very accommodating for the three of us ladies on our girl's trip. It was our first time in the city but it will not be our last! Already planning our girl's trip for next year and we will stay here again! The apartment was spacious and so quiet! Didn't even know there was anyone else around. It's located within walking distance to Times Square, Penn Station, Grand Central Station, and lots of good food. Michal was super nice and very accommodating. Would stay there again if we go back. Stayed in Michal's 2-bedroom apartment while on business in late October 2018. The apartment is well appointed and very comfortable. It faces the interior of the block and is consequently really quiet; I slept like a rock. Its proximity to Times Square and mass transit is excellent. Michal is very nice, informative, and accommodating. I will definitely stay here again. This gem of an apartment is tucked away on a lovely residential street mere steps from Time Square (less than a block away from the Time Square Subway). The apartment is large at around 1250 sq. ft. and filled with natural light. It faces the gardens between buildings, giving it a sense of calm and quiet that is rare and precious in this part of the city. The street is tree and brown-stone lined, but is less than 1/2 a block away from the excitement of the Hell's Kitchen and Time Square area. This part of the city, beside the attractions of Time Square itself is, both a cultural and transportation hub. Hell's Kitchen is widely considered the food capital of New York, with countless trendy, classy, and exciting restaurants of every variety and style. In addition, you are at the center of New York's bustling Theater District. Got a Broadway show to catch? They are all within a 10 minutes' walk of the apartment! Sometimes we are unable to accommodate stays depending on the availability the rest of the month. Minimum stay is subject to change. Please email us instead of doing 'book it now' if you would like to inquire about a shorter stay or a discount for a longer stay. Thanks! We hope to hear from you. Prices vary depending on length of stay, how booked the remainder of the month is, and what days of the week are being booked. Just send an inquiry and we will send you a quote and an explanation of pricing if desired. The minimum stay subject to change, please send an inquiry when looking to stay for less than 5 days and we will let you know if we can accommodate you.